2019, Lets Do This! – Part 2 – create trust daily. Yesterday, I went over my 2018 goals and shared a bit about which ones I made progress on and which ones I failed at (if you want to read through those you can check that post out here). But today I want to dive into my 2019 goals and what I am looking forward to in this new year! As I started my Powersheets prep, I referenced last years prep work a lot because I really wanted to take in consideration where I was last year, how far I have come, and what I am working toward over all. For this year, I felt like I did a much better job of “naming” my goals in a way that I gather my “Big Picture Goal” at a glance. What That Means For Me: My word for 2019 is “present” and I am honestly so excited for this goal and the big picture of how it makes me feel when I think about it. Not only does this include spending focused time with my husband + kids and purposefully going social media free, but it also includes trying new things, exploring, and just enjoying life. I tend to default to “No” and be more of a home body, but this year I want to experience and enjoy each day with more intention and excitement. What That Means For Me: Basically, this is the same goal I had last year to get rid of debt, but I have a bit more of a game plan this year. What That Means For Me: Just reading this makes getting healthy feel more like a happy adventure and not such a daunting task! I have already started drinking Kelly LeVeque’s Fab 4 Smoothies once a day (from her Body Love book, which I highly recommend). In addition to this change, I plan on cutting sugar from my diet, opting for a bit less carbs, exercising at a pace that works for me, and cooking more. The cooking one is pretty big because I have been cooking less and less since my workload and our busy schedules have gotten more and more full. What That Means For Me: This one is another HUGE one for me. The clutter in my home is 1000% associated with stress and lack of motivation. A lot of the extra clutter is office stuff that will go in there once it gets finished (one day….). But I have full confidence I will be a much happier momma and wife when I have clear space and clear floors. I am joining Allie Casazza’s decluttering movement and getting these toys cleared out, clothes sorts and minimized, and (hopefully one day soon) getting all of our office stuff moved into our fancy new office and out of my house! What That Means For Me: This is a fun one! First, I plan on moving our shop from Create Trust Daily to our business site since that’s where my product ideas are tending to lean toward. I really want Create Trust Daily to be more personal and purposeful in 2019. I plan on developing SWLA: Live+Learn+Love and doing some really great stuff with that. Plus, I have a few products I would like to bring to life in 2019! Basically, this goal is for thinking outside of the box, creating and having fun. What That Means For Me: For 2019, I plan on learning in many areas of my life. I want to continue to read my Bible and dig into God’s Word, and once I finish going through the rest of the New Testament I want to start reading the Bible all over again chronologically (if you know any good chronological reading plans please feel free to share in the comments)! I would also like to read more this year. I feel like this is a goal for me every year, but I have made great strides in reading more lately so I am hoping to read either one book per week (audio or physical book) or if that gets too daunting, I’ll try one book per month. **I will share my 2019 Reading List with you soon so keep a look out for that!! ** And then last, I wrote down to research old things I have learned to look for a new way to do them. This kinda goes with streamlining business, but with a bunch of new software and apps coming out I know there are some tools we may be able to use to make getting our work done less work. That’s it! I have 7 goals for 2019 and I am super excited to get started on these next week. 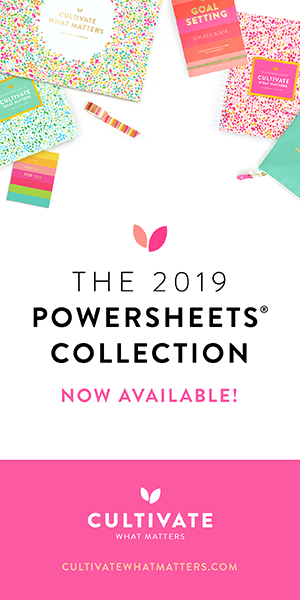 I’ll start my January Powersheets prep work in a few days and I may try and share a bit of that here on the blog, so you can see how I am putting these 2019 goals into action starting in January. Please let me know if you have any questions about any resources or goals I have shared, or feel free to share some of your 2019 goals in the comments below. I hope you have an awesome New Year and knock out some amazing goals alongside me!